Finally got a chance to take out the .357 I got. I took it out and plinked with it a bit the same night I took out my KSG. The only time I could shake free of all my other commitments was after work and in the early evening, albeit just past dusk. All the shooting actually occurred via flashlight or with the aid of my truck’s headlights. It is also nice to note that it was 30 degrees, very windy and I had my family with me. Needless to say, it wasn’t all pina coladas and bikinis. There was a strong shiver influence with each shot fired, so keep that in mind….. Here is the “semi” final configuration for this pistol. I have an M-3 military holster for it that I had to do some leather work on to allow it to fit over coats and a Butler Creek oversized hand grip on it until I get my custom corian grips built. Due to the bad weather, my range was not the best in the world. I actually tried to take pictures of it several times, but it was too dark. Just so you understand where I was shooting, I live in a densely wooded region of the US that has a lot of logging that takes place. We were shooting on a skidder landing off the side of a logging road at about 3500 ft elevation. There were patches of snow on the ground, it was 30 degrees according to my truck’s thermometer, and there were 25+ mph gusts of wind coming off the edge of the ridge. The only way I could get a solid range for the distance I was shooting was to wander around with my range finder until I could get any reading I could. The ONLY range that I could get to register was 19 yards from the top of a rock sticking out of the ground to a stump that we used to prop up the targets. All shots were at 19 yards for as close to “scientific” accuracy as this redneck could muster at that time….. These shots were fired at a IDPA cardboard target at 19 yards distance in high wind and through the use of my truck’s headlights. The first one shows the 158 gr .357 Independence brand cartridge results. As you can see, I must have held a little low and left. For sake of my pride, I will blame gloves and environment for the poor shooting. I will say that it was not too bad considering I could barely see the old school fixed sights. Most of my aiming was by instinct and best guess since I couldn’t see the sights that well. 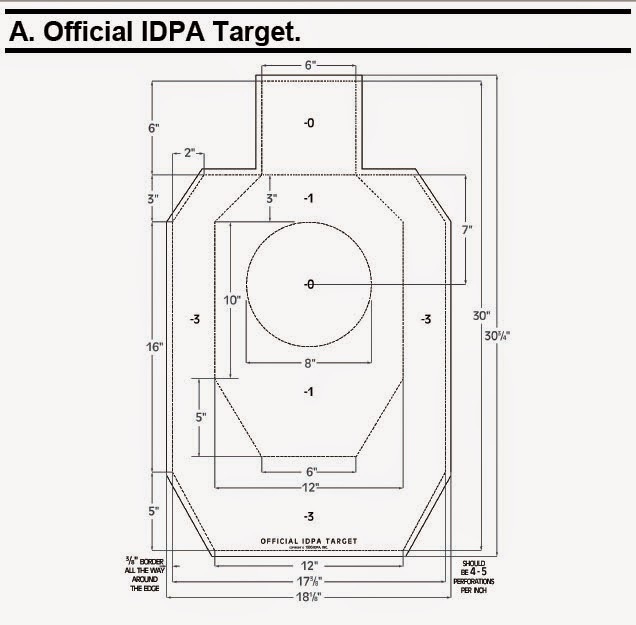 For those of you who are not familiar with the sizing of these targets, the ring is 8 inches in diameter. This means that I had around a 4′ grouping. Also, for pride’s sake, I will mention that these were also the first 6 rounds I put through this pistol since I purchased it. The next shots were taken with Remington 140 gr .38 Special. I was pretty frozen at this time for I almost forgot to shoot something to take pictures. 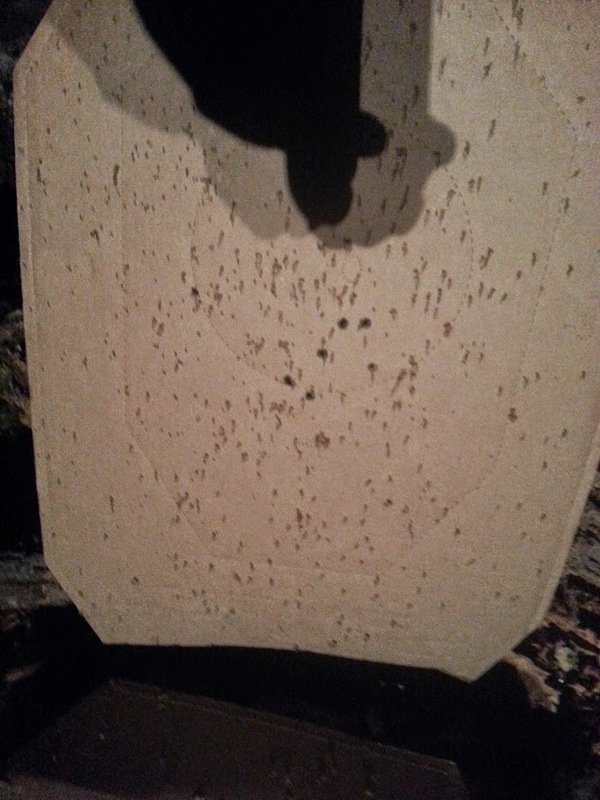 As you can see, my son already got to this target a few times with the KSG we were also plinking with. Again, the range was 19 yards and in the same conditions. The only additional thing I would mention is that I had already been shooting for about 90 minutes and there are 2 holes right next to each other… Yup. Almost put one in after another… Oh yea…. 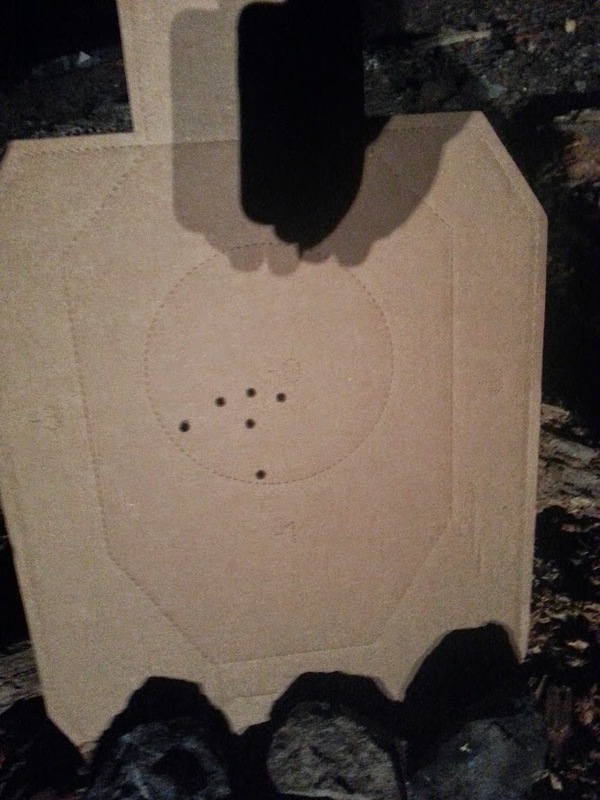 Then again, forget the others that are not touching…..
Now I would like to point out that I also fired 1 round of Horady 140 gr Leverevolution in .357. I killed an empty .38 special box at around 12 yards with a single shot right through the center of the box. That tells me that all 3 of these rounds seem to hit in the same location at similar distances. I am sure that with someone warm and having a steadier hand, there will be some definite differences in trajectory and point of impact. For this cold and 1/2 frozen redneck at night and dealing with cold family members, I claim that the fired the same. Since I decided to start increasing my firearms inventory beyond the firearms that I was intimately familiar with I have run across several that impressed me. This is definitely one that impressed. It impressed me more and I enjoy shooting it more than any other pistol I currently own, which really says a lot for those that know me. The only thing I have enjoyed firing more was my KSG. 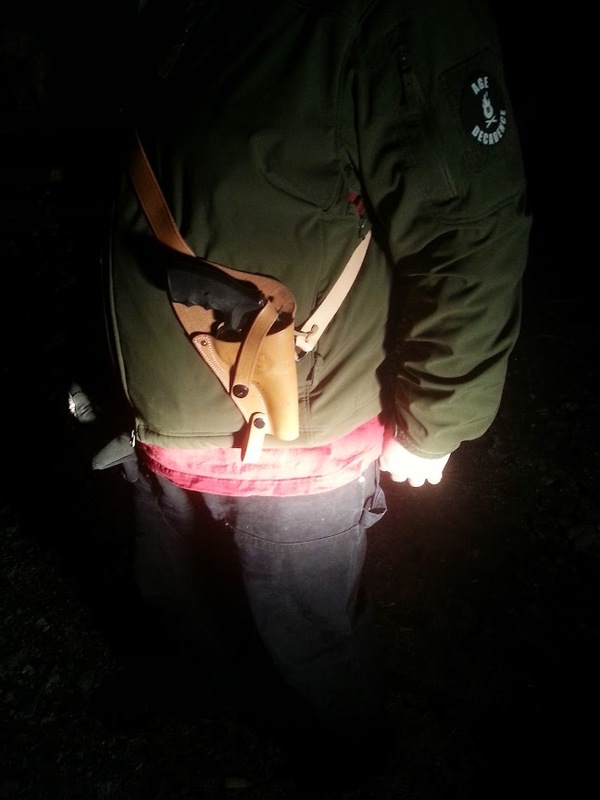 This entry was posted in Firearms and tagged .357, Model 13, S&W, Smith and Wesson on November 24, 2014 by Woodsbum.